Objective: The objective of the study is to assess the efficacy of laparoscopy compared with laparotomy in extrafascial hysterectomy and lymphadenectomy for endometrial cancer. Design: This was a retrospective study of small cases over a 5-year period. Setting: This study was conducted in Putrajaya Hospital, a district hospital with consultant care level in obstetrics and gynecology. Sample: Forty women presented with confirmed cases of endometrial cancer based on histopathology result and underwent extrafascial hysterectomy with or without lymphadenectomy between January 2010 and December 2014. Materials and Methods: Patient outcomes were compared between 26 women who underwent laparoscopic total hysterectomy with or without lymphadenectomy and 14 women who underwent open laparotomy extrafascial hysterectomy with or without lymphadenectomy. Data were collected using electronic medical records. Main Outcome Measures: Postoperative outcomes, operative time, total intraoperative blood loss, number of lymph nodes harvested, and total days of postoperative stay were obtained. Results: There was a significant reduction in operative blood loss in the laparoscopic group with mean 262.50 ± 47.87 and laparotomy group with mean 381.82 ± 138.33, 95% confidence interval, P < 0.05. Postoperative hospital stay was also significantly reduced in the laparoscopic group, where the mean postoperative stay in laparoscopic group was 2.5 ± 2.0 days and laparotomy 5.0 ± 3.6 days. There was no significant difference in mean operative time (the mean operative time: 256 ± 76.40 for laparotomy and 288.75 ± 43.66 for the laparoscopic approach). 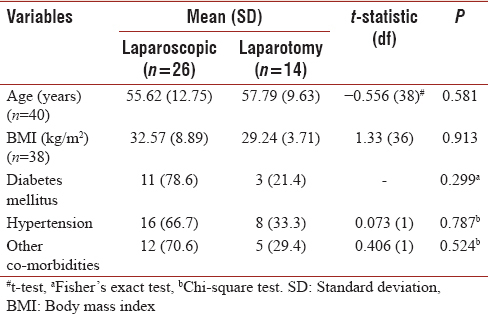 More number of lymph nodes were harvested laparoscopically (29.75 ± 16.59) than laparotomy (23.0 ± 12.62); however, this was not significant. Conclusions: Laparoscopic surgery had significant lesser blood loss and it is comparable to laparotomy in the surgical management of endometrial cancer. Experienced surgeon will be able to perform hysterectomy and lymphadenectomy as equally good to laparotomy with adequate tumor excision and complete staging. Treatment and staging for endometrial cancers or neoplasia has been surgical, consisting of laparotomy hysterectomy and bilateral salpingo-oophorectomy with lymphadenectomy and total laparoscopic hysterectomy (TLH) and bilateral salpingo-oophorectomy with lymphadenectomy. Before the refinement of total laparoscopy hysterectomy techniques, it was considered as a challenging procedure due to higher risk of ureteric injury, but with trained personnel, training facilities, and new advances in equipment used in this approach such as uterine manipulators, it has increased the ease of this procedure and reduced the risk of ureteric injury. The role of lymphadenectomy was supposed to improve surgical staging; however, recent studies have shown that lymphadenectomy has not shown to improve recurrence-free, disease-free, or overall survival. Suspected endometrial carcinoma patients should have lymph node sampling as part of their surgical management as this will play a role in staging and further treatment. Postoperatively, a patient is followed up for local recurrence or may need to proceed with chemotherapy or radiotherapy based on staging and histopathology. The 5-year survival ranges from 10% to 73% (10% for advanced Stage IV disease and 73% for Stage I disease). The most important procedure in treating endometrial cancers is to remove the tumor and its potential metastatic site as complete as possible and as early as possible to start adjuvant treatment. As many gynecologists are moving toward laparoscopy, this study will examine the outcome of both surgical methods. This study will compare the operative outcomes of open laparotomy hysterectomy and bilateral salpingo-oophorectomy, and TLH and bilateral salpingo-oophorectomy, both with or without lymphadenectomy in the treatment of endometrial carcinoma done in Putrajaya Hospital between January 2010 and December 2014. This is a retrospective study of small cases over a 5-year period of women with histopathological examination confirmed for endometrial cancer and women who underwent extrafascial hysterectomy and bilateral salpingo-oophorectomy with or without lymphadenectomy between January 2010 and December 2014. Data were collected using electronic medical records in Putrajaya Hospital. Putrajaya Hospital is a government district hospital with consultant-level obstetric and gynecology care. Patients were seen at primary centers at several districts and referred to Putrajaya Hospital for suspected endometrial carcinoma. The patients who were referred were then seen at gynecology outpatient clinic and seen gynecology specialist or consultant who will then decide which approach should be done based on the patient's medical background and findings. The operative procedure was done by specialist (more than 5-year training). Case data were collected on demographic detail (age and parity), clinical symptoms (pain and bleeding), choice of surgery (laparotomy or laparoscopy), operative outcome (operative time, estimated blood loss, patients outcome, and length of hospital stay), and number of lymph nodes harvested. The association between method of surgery and categorical data was measured using Chi-square test and Fisher's exact test, while t-test and Mann–Whitney U-test were used for continuous data. Data gathered are stored and analyzed using Microsoft Excel 2010 and IBM Corp. Released 2012. IBM SPSS Statistics for Windows, Version 21.0. Armonk, IBM Corp., NY. There were a total of 40 patients who were diagnosed with endometrial cancer. All cases were with a confirmed histopathological result. Of the 40 patients, 14 patients underwent laparotomy hysterectomy, bilateral salpingo-oophorectomy ± lymphadenectomy (35%), while the other 26 underwent TLH, bilateral salpingo-oophorectomy ± lymphadenectomy (65%). Mean age of patients diagnosed with endometrial cancer is 56.38 (11.67) years with mean parity 2.63 (2.32). Nearly, one-third of the patients were nulliparous (30%). There is also higher incidence of elevated body mass index (BMI) in patients with endometrial carcinoma, mean 31.34 (7.52). A majority of these patients presented with postmenopausal bleeding (47.5%), followed by prolonged bleeding (22.5%), menorrhagia (27.5%), and pain and abdominal mass (2.5%). There is no association between the patient's demographics and clinical characteristics (BMI, age, reproductive stage, and comorbid) with the chosen method of surgery [Table 1]. In this study, there were only two cases of subcutaneous emphysema in the laparoscopic group and one patient with acute urinary retention. In the laparotomy group, there were two cases of wound breakdown, one paralytic ileus, one patient required blood transfusion, and one patient who developed an acute coronary syndrome [Table 2]. There is a significant reduction in operative blood loss in the laparoscopic group with median (interquartile range [IQR]) of 200 (200) ml and laparotomy group with median (IQR) of 500 (400) ml, P < 0.004. There is no significant difference of mean operative time. The mean operative time for laparotomy is 228.57 (55) min compared to laparoscopic 217.15 (51) min. 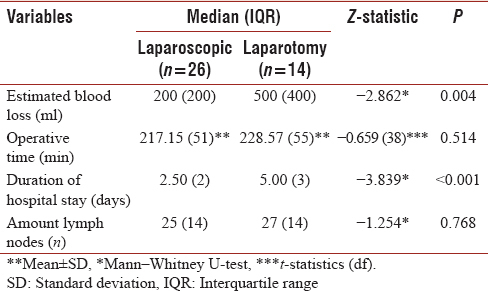 There was a significant reduction in the duration of postoperative stay for laparoscopic patients compared to the laparotomy group, median 2.5 (2) days and laparotomy median 5 (3) days, P < 0.001, respectively [Table 3]. One-year survival rate in this study is 97.5% (a patient from laparoscopic group passed away due to stroke 6 months postoperation). As technology develops, new surgical methods were advocated to patients. Whatever methods chosen, the principle is not to compromise the surgical excision and completeness of that particular surgery in excising the tumor. Other important aspect of surgical tumor management is early recovery and immediate adjuvant treatment to ensure complete or maximum eradication of tumor cells. Staging of the disease plays an important role in choosing the type of surgery to be undertaken. Staging is based on the latest International Federation of Gynecology and Obstetrics (FIGO) staging; Stage I disease is confined to the uterus and is further divided into Stage IA disease that involves <50% of the myometrium involvement and Stage IB disease that involves more than 50% of the myometrium. Stage II disease involves spread to the cervix. Stage III disease involves local or regional spread and is further divided into Stage IIIA where the tumor invades the serosal or adnexa, Stage IIIB that involves spread to the vaginal wall with or without involvement of the parametrial areas, and Stage IIIC where the disease has spread to distant lymph nodes (pelvic lymph nodes or para-aortic lymph nodes). Stage IV is divided into Stage IVA where the tumor invades bladder with or without involvement of the bowel mucosa and Stage IVB which involves distant spread of the disease to the other abdominal structures or inguinal areas. The stage of the patient's disease and the surgical treatment is important as it may affect the overall outcome of the disease. Most surgeons opt for laparoscopic surgery in patients with early stage of the disease, mainly those with stage I disease and in some cases, stage II disease (disease spread is confined to uterus and cervix) where complete excision through laparoscopic approach is feasible. Majority of the cases done through laparoscopic approach in this study were in Stage I of the disease and were proven with histopathological results. As shown in this study, the laparoscopy technique does not compromise the tumor excision margin. A complete tumor excision, i.e., full hysterectomy can be done similar to laparotomy technique. As most gynecologists will proceed with lymphadenectomy in most patients diagnosed with endometrial carcinoma, some will opt for laparotomy as most prefer a direct tactile approach during lymph node dissection. In this study, it shows that lymph node dissection is also achievable through the laparoscopic group as the number of lymph nodes obtained was similar in both arms of the study. Some of the cases in this study did not have the lymphadenectomy procedure done as the operation was for other conditions such as endometrial hyperplasia or ovarian malignancy, and in these cases, endometrial carcinoma was diagnosed postoperatively based intraoperative findings and confirmed by histopathology results. In such cases of suspected ovarian malignancy, the suggested surgical procedure for complete staging would be hysterectomy with bilateral salpingo-oophorectomy with omentectomy. In any tumor management, it is also pertinent to ensure patient stays as healthy as possible. Therefore, any procedure advocated must be at the end of the surgery must not cause more morbidity to the patient. The more morbid the patient becomes, i.e., from excessive blood loss, wound infection, poor ambulation, and other complication, the more difficult from them to fight the malignancy as the body will also have to deal with morbidity inflicted by the surgery. With the laparoscopic approach, wounds would heal within 2 weeks and would allow further treatment for endometrial carcinoma such as chemotherapy or radiotherapy to be commenced earlier and could improve the overall survival rate of patients with endometrial carcinoma. With these facts, we believe that laparoscopic surgery can be offered in any age group and in whatever clinical premorbid conditions similar as in laparotomy. Elderly age, obesity, and nulliparous women as well as patients with hypertension or diabetes are not contraindications to TLH. In fact, because of its relatively less morbid complications and faster ambulatory outcomes, it should be the approach of choice in patients with endometrial malignancy. Another study has shown that both laparoscopic and laparotomy groups were similar with regard to their characteristics such as age, BMI, and surgical FIGO staging. Obese patients or patients whom are at risk of deep vein thrombosis or pulmonary embolism will benefit from this approach as the incisions were small and less painful and most patients will ambulate early. However, there are some conditions that may warrant extra caution before deciding for laparoscopic surgery such as patients with underlying chronic lung conditions with restricted lung function or morbidly obese with obstructive sleep apnea. Anesthetic input combined with medical physician or ear, nose, and throat (ENT) specialist assessment may be required before deciding the type of surgery. The reason for this is through the laparoscopic approach, the anesthetic team may have difficulties intraoperatively to adequately ventilate the patient due to insufflation of the abdomen, and some procedures may require conversion to laparotomy due to difficulty in proceeding with the laparoscopic technique due to poor visualization and difficulties in manipulation of the instruments. However, there is limitation in this study as most of these patients' BMI is below 40, and further data and studies may needed to find the ideal BMI range for laparoscopic surgery. The other important aspects that favor laparoscopic approach are the reduction of blood loss, postoperative stay, and complications. As patients will be less morbid and they recover early, the body may be able to focus in battling the residual tumor with or without adjuvant treatment. This is similar with a comparison study, which showed a signifi cant difference in blood loss and shorter hospital stay, favoring laparoscopic technique.,,, Zapico et al. found that laparoscopic staging was more frequently associated with lower postoperative morbidity and shorter length of hospital stay when compared with laparotomy approach. Postoperative complications were more frequent in laparotomy group mainly related to abdominal wall incision events. Laparotomy group of the patient is at risk of higher morbidity related to larger wounds, i.e., blood loss and infections. Larger incision wound needs more time to heal and it is more painful and more susceptible to infections. All these were avoided in laparoscopic approach with at the most 5 ports with the largest measurement of 12-mm ports which were used. Most patients who had a TLH with or without lymphadenectomy were discharged on day 2–3 postoperatively. TLH approach has been deemed feasible for treatment of endometrial carcinoma, as with this approach, some studies have shown a reduction in the timing of operation and potentially quicker than laparotomy with fewer complications and shorter hospital stay.,, Some studies have commented on longer operative times of laparoscopic approach. In this study, the duration of surgery was compared in both groups. In certain centers that practice TLH routinely and there is availability of instruments, the skill and expertise of surgeon may play a role in operative time. Laparoscopic surgery had significantly lesser blood loss and is comparable to laparotomy in terms of surgical management of endometrial cancer. Experienced surgeon will be able to perform hysterectomy and lymphadenectomy as equally good to laparotomy with adequate tumor excision and complete staging. Thus laparoscopic approach should be considered when discussing surgical intervention with patients with endometrial cancer. We would like to thank Tengku Hanidza binti Tengku Ismail, Associate Professor, Department of Environmental Sciences Faculty of Environmental Studies University Putra Malaysia. Lin F, Zhang QJ, Zheng FY, Zhao HQ, Zeng QQ, Zheng MH, et al. Laparoscopically assisted versus open surgery for endometrial cancer – a meta-analysis of randomized controlled trials. Int J Gynecol Cancer 2008;18:1315-25.
de la Orden SG, Reza MM, Blasco JA, Andradas E, Callejo D, Pérez T, et al. Laparoscopic hysterectomy in the treatment of endometrial cancer: A systematic review. J Minim Invasive Gynecol 2008;15:395-401. National Cancer Registry, Minister of Health. Malaysian Cancer Statistics -Data and figure Peninsular Malaysia. National Cancer Registry, Minister of Health; 2006. Luesly DM, Kilby MD. “Endometrial Cancer.” Obstetrics and Gynaecology. An Evidence-based text for MRCOG. 3rd Edition. Boca Raton: CRC Press, 2016. p.873. Amant F, Moerman P, Neven P, Timmerman D, Limbergen EV, Vergote I. Endometrial cancer. Lancet 2005;366:491-505. Rose PG. Endometrial carcinoma. N Engl J Med 1996;335:640-9. O'Hanlan KA, O'Holleran MS. Surgicopathological data on 90 patients having total laparoscopic hysterectomy with and without staging lymphadenectomy for uterine neoplasia. Gynecol Oncol 2006;101 1 Suppl: S120-1. ASTEC Study Group, Kitchener H, Swart AM, Qian Q, Amos C, Parmar MK, et al. Efficacy of systematic pelvic lymphadenectomy in endometrial cancer (MRC ASTEC trial): A randomised study. Lancet 2009;373:125-36. Zapico A, Fuentes P, Grassa A, Arnanz F, Otazua J, Cortés-Prieto J, et al. Laparoscopic-assisted vaginal hysterectomy versus abdominal hysterectomy in stages I and II endometrial cancer. Operating data, follow up and survival. Gynecol Oncol 2005;98:222-7. Zhang H, Cui J, Jia L, Hong S, Kong B, Li D, et al. Comparison of laparoscopy and laparotomy for endometrial cancer. Int J Gynaecol Obstet 2012;116:185-91. Melendez TD, Childers JM, Nour M, Harrigill K, Surwit EA. Laparoscopic staging of endometrial cancer: The learning experience. JSLS 1997;1:45-9. Api M, Kayatas S, Boza AT, Nazik H, Adiguzel C, Guzin K, et al. Surgical staging of early stage endometrial cancer: Comparison between laparotomy and laparoscopy. World J Oncol 2013;4:235-40. Zorlu CG, Simsek T, Ari ES. Laparoscopy or laparotomy for the management of endometrial cancer. JSLS 2005;9:442-6. O'Hanlan KA, Dibble SL, Garnier AC, Reuland ML. Total laparoscopic hysterectomy: Technique and complications of 830 cases. JSLS 2007;11:45-53. O'Hanlan KA, Huang GS, Garnier AC, Dibble SL, Reuland ML, Lopez L, et al. Total laparoscopic hysterectomy versus total abdominal hysterectomy: Cohort review of patients with uterine neoplasia. JSLS 2005;9:277-86.